Key inquiry question: What are the characteristics and effects of forces in nature? 3. Pressure • Pressure = force per unit area (p = F/A). • The transmission of pressure in hydraulic systems is used in machines e.g. the hydraulic press. Hydraulic systems work due to the incompressibility of liquid and if pressure is applied to one part of an enclosed liquid, the pressure is transmitted to all parts of the liquid. • Pressure due to a liquid column = height of column x density of the liquid x gravitational field strength (p = hρg). • Pressure at any one depth in a liquid acts equally in all directions. 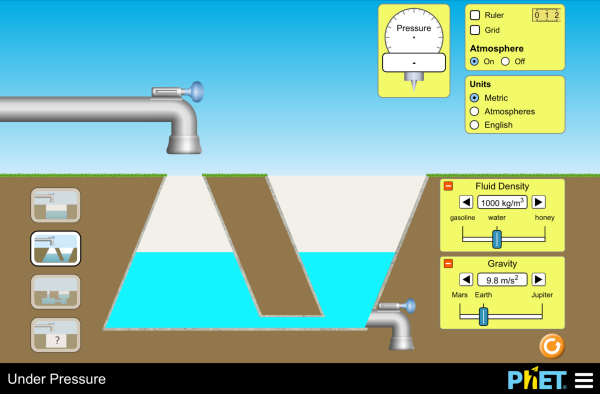 The height of a liquid column may be used in instruments such as a barometer and manometer to measure the atmospheric pressure and pressure differences. • pressure as force/area, (p = F/A) and use the concept of pressure to explain relevant everyday events (e.g. cutting with a knife, use of skis on snow). Students have difficulty understanding that pressure at the same depth of a fluid is the same in all directions. They tend to think that the pressure acting downwards is greater.